Fishing for evidence. You've got to dive deeper than that. Politics is best experienced with a sense of humor. I need a radical shift from my sedentary 12-hour workdays. Of course, what I really mean by a radical shift is putting a YouTube playlist on and moving over to the bed behind my workspace with a bag of baby carrots. That’s 5 steps to exercise my muscles and low fat snacks to cut the calories, an astounding improvement from my protracted days of immobility and frequent excursions into large bags of tasty trans fats. Having been detached from the real world for days I was naturally eager for some good entertainment. 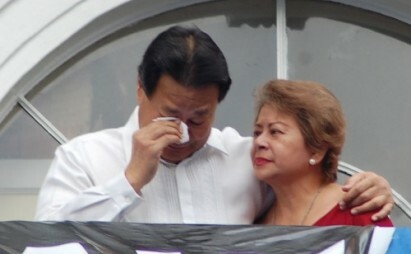 Luckily, highlights of Chief Justice Corona’s impeachment trial were multiplying like rabbits online. My blog lurkers noticeably veer away from posts where I’m waxing poetic about politics. After all, nothing else is better than politics (except maybe for a ride on a Philippine bus) when it comes to inducing distress, nausea and high blood pressure. What many don’t realize though is that, to preserve good health, political topics are best experienced with a sense of humor. The current impeachment trial has proven funnier than PNoy’s unending search for the girl who can stand having Kris for an in-law. The source of hilarity stems in part from the members of the prosecution being sorely out of their league (like Luke crossing sabers with Emperor Palpatine or Westlife challenging Whitney Houston to a sing along) and so rusty they’ll give you tetanus. Somebody please tell Rath I found his sister. Lady Senator from Mount Doom: How many witnesses do you plan to present? Baby Luke: 100 witnesses your honor. Lady Senator from Mount Doom: My foot! Are you kidding me? 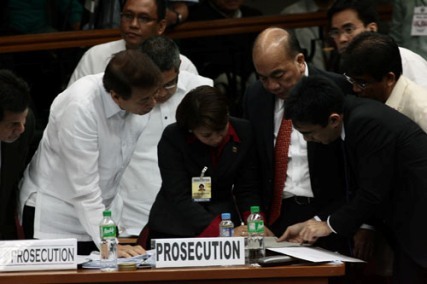 By the time the trial ends they will have killed at least three senators, Enrile by old age, Santiago by cardiac arrest and Lapid by profuse nose bleeding caused by prolonged exposure to English. Justine Bieber: (Turns to his pal) Hey Luke, is he or isn’t he our witness? That was a stunning display of how a prosecution panel can demolish itself with its own witness. Then there’s --- Fishing for evidence. More fun Funnier in the Philippines. Prosecution says they received incriminating bank documents from an anonymous small lady who is a no show on the senate CCTV videos. The documents have been called fakes but prosecutors stand by their story, saying that the lady was really so small, smaller than the little girl in Veterans Memorial, that the CCTV cameras couldn’t have picked her up. Not to be outdone defense claims they also have an anonymous Palace tipster who says PNoy offered 100 million pesos per senator to win them over. At the various expressions of disbelief over the availability of such huge funds, defense says Aquino has a secret plantation of money trees from where the money will come from. Being an anonymous tipster has become so fashionable I plan to give anonymous information on where the prosecution team can get law books in bulk and where the defense team can get textbooks on drama scriptwriting. "Don’t ask a question if you don’t know the answer." –Some dead law expert quoted by the Lady Senator from Mount Doom. Personally, I think Corona has enough dirty laundry to get himself into trouble. Fortunately for him, there is a shortage of brilliant congressmen and prosecutors. Then again, we’ve only really just begun. Maybe Luke and his team will have evolved into a more intelligent species by the time we reach article 8. "By the time the trial ends they will have killed at least three senators, Enrile by old age, Santiago by cardiac arrest and Lapid by profuse nose bleeding caused by prolonged exposure to English." - ROFLOL! LMAO! super love it! hahahahaha! so true! Personally, I think Corona has enough dirty laundry to get himself into trouble. Fortunately for him, there is a shortage of brilliant congressmen and prosecutors. Oh Grace every single time! Keep writing, you! Really for me, this trial is taking way too long that it can be considered as a soap opera or a comedy show. O well I guess that's just the way our country works. haha, I liked emma's comment re: killing at least 3 senators. not only that, I am sure they are also using public resources for this long and winding trial. It gets tiring to listen to the same news all over again. Yeah...the big question is, when will it ever end? There's too much drama in this impeachment .. there're too many lies that maybe will just boil my head of anger.. LOL. That's why I stop watching it.